Turtle Spring = I found a turtle, what do I do?! And spring is here! Yay, we are over the murky winter! Hopefully all turtles (and other creatures) successfully hibernated and now are ready for another wonderful year of adventurous life of searching for a mate, reproducing and hatching the next generation of chelonians. Spring is a busy and challenging season for turtles and tortoises. After turtles emerge from hibernation they are on the quest of filling their bellies and finding a mate to reproduce. Some turtles can be woken up early or even evicted from their spot by eager humans spring cleaning their properties from shrubs and leaves – a turtle's favored spots to safely overwinter. If such a thing happens and you find a turtle on your property, and you live on a nice natural property with shrubs, trees, and a creek nearby and away from busy streets, you can probably leave the turtle where you found it. Keep your dogs away from the yard for a day or two so the turtle can find a safe retreat. 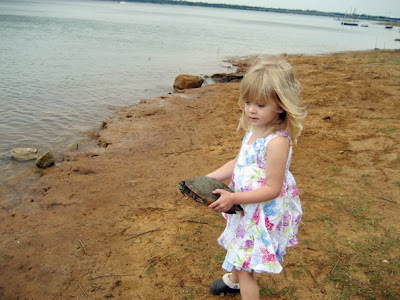 If you found the turtle at a spot that you think is unsafe, or you are not sure what to do, you can contact us DFW Turtle & Tortoise Club or any other turtle club or herpetological society in your area for further advice or assistance. 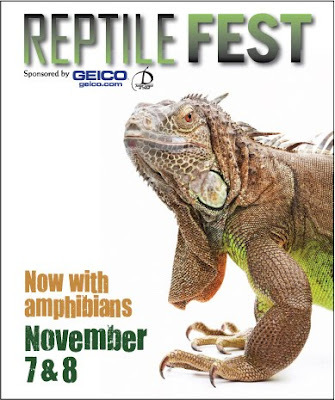 You can reach the DFW Herpetological Society at: contact@dfwherp.org or (972) 949-4191. 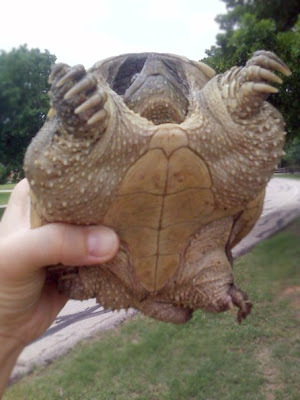 Or if you are near Houston area contact Gulf Coast Turtle & Tortoise Society www.gctts.org . The best thing is to take pictures of the turtle and possibly the area for easy identification. Most cell phones have a camera now and you can text MMS the photos to our email DFW Turtle & Tortoise Club. 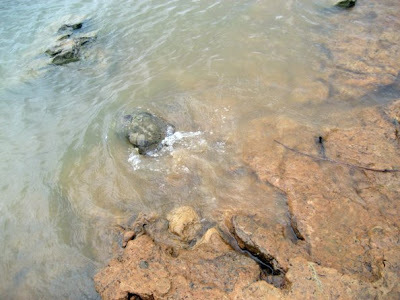 You can also visit www.texasturtles.org to try to identify the turtle. The usual situation when people encounter turtles is on the roads, especially during a rainy and cloudy day. That's the time when turtles travel to find a better location, mates, or the best spot to lay eggs. Females can travel considerable distances to find the perfect spot and that includes crossing busy roads and highways. 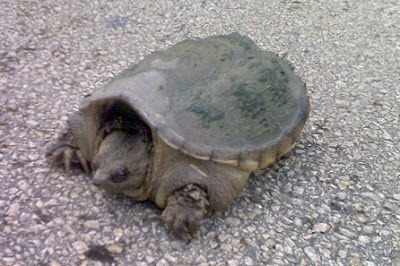 Most road-killed turtles are female. One study says that some turtles like the sandy banks of the road for its loose sandy soil with sunny warmth promising stable temperatures for incubating the eggs. This could help explain the larger number of females found on the roads. What to do when you find a turtle like this? The best thing is to move the turtle off the road and point it in the direction they were heading. Turtles are very determined about where they want to go, so putting them back in the other direction is not a good idea, even if that direction looks better to you. It only gives them another chance to get hit by a car when they turn around to go where they were going in the first place. 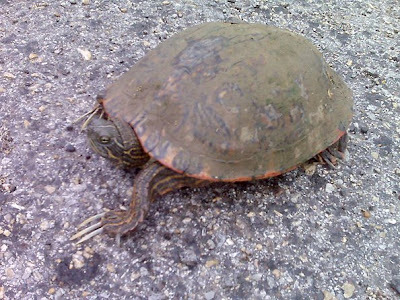 If you find the turtle on a busy highway and you wonder where it could possibly come from my conclusion is that the turtle may have come through culverts under the road. 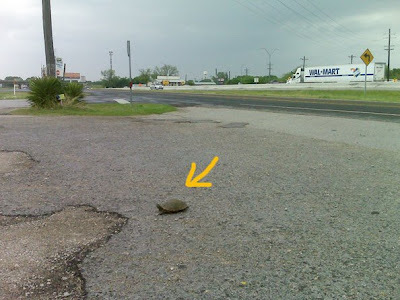 I think that was the case with this turtle we came across a couple of days ago on I-35 by Lake Dallas. It was a male with the long Freddy-Kreuger-like front nails and long tail. I believe he was a painted turtle (not the usual red eared slider) as the nice reddish color of his shell was peeking from under the mud and algae that covered him. There was a fence along the grass and highway as you can see on the other side. He was sitting on this mini parking spot totally perplexed (at least I think) :-) . I couldn't find a good place to put him and I left my rescue plastic box at home of course. Luckily I had a paper bag so I put him there and we drove around to find the nearest access to the lake. I had to wake my daughter up; she would never forgive me if I didn't, and we went to release the guy into the lake. It was very happy moment. He didn't even hesitate to say thanks. That day turned out to be quite a turtle day. While driving down the road I saw another familiar shape in the middle of the neighborhood road. This time it was a Common snapping turtle. And by a quick look I could tell it was a guy. There was a little creek at the side of the road flowing in and out of the concrete duct. He was sitting in the middle of the road facing the direction of the cars. The road had a green belt in between and further on the other side was a neighborhood pond with a fountain. That was the best bet for safe release. The snapping turtles seem to me to be lot less skittish then the sliders. But don't let this fool ya. They can extend their neck back quite far and deliver a powerful bite. The safest handling of a small one is to hold it by the back of the shell, with your hands above the back legs, grabbing the back edge of the top shell. NEVER HOLD TURTLE BY ITS TAIL! This can dislocate their vertebrae and cause fatal injury. If the turtle is too large or you are not sure, use a stick to push the turtle off the road (but do not push the soft body, hold the stick vertical and just lean at the edge of the shell near the tail, like sweeping the turtle forward). Or you can call 214-368-5911 www.911wildlife.com or check http://www.911wildlife.com/relatedLinks.html . There is always someone on the line who can help to find the rehabber closest to you. Or you can take the turtle to the nearest veterinarian's office and ask if they are licensed and willing to take wildlife. The only people or organizations who may be able to come pick up the turtle if you call them are volunteers. All their expenses are paid from their own pockets, so I encourage you to give a donation - it is always nice and welcomed. Care and vet bills can get expensive. Last but not least I would like to point out that when you try to save any animal, try not to put your life in danger. Stopping suddenly on the busy road or running out of your car without looking first for other cars can be fatal. Also make sure when you have children in your car that they are buckled up and remain seated and in the car before you can safely get to the animals. Yes there was a case of a little girl unbuckling herself and getting out of the car before the parent got to her and she was killed instantly when she ran into a highway to save a turtle. Many cars have a child locks on the door that have to be released by the driver before any door can open. 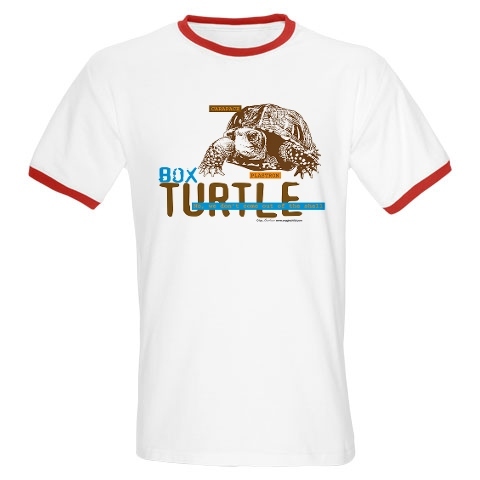 Enjoy turtles in wild and leave them in wild. If you are already guardian of a turtle or two take care of them well. Labels: Articles, Found turtle, what do I do? We are going to hang out at the NARBC Expo in Arlington's Convention's Center this Saturday February 7th, 2009. Then we'll meet for a turtle chat at local restaurant Nizza Pizza at 5 15pm after the expo is done.